North and South Holland shown together within the Netherlands. Holland is a region in the central-western part of The Netherlands. It originated in the early twelfth century as a fief of the Holy Roman Empire, ruled by the Count of Holland, and later became the dominant province of the Republic of the Seven United Provinces (1581–1795). The history of the region is the story of the microcosm of the past thousand years of European development in the areas of religion, politics, and everyday life. The four largest cities of the Netherlands—Amsterdam, Rotterdam, The Hague, and Utrecht—are in Holland, giving the region a predominance in the nation. A maritime and economic power in the seventeenth century, Holland today consists of the Dutch provinces of North Holland and South Holland, with a combined population of 6.1 million in 2008. Due to its historic and cultural dominance, both the region and the present nation of The Netherlands are often called “Holland.” However, this name as used for the whole country only truly applied for the short period of the Napoleonic Kingdom of Holland, which occupied the territory of the old republic between 1806 and 1810. Holland, whose people were known to emphasize a love for justice and freedom, became a refuge for the persecuted and a home for many migrants. The number of first generation immigrants in Amsterdam was nearly 50 percent in the seventeenth and eighteenth centuries. Two of the most famous people to emerge from the horrors of World War II were from Holland; Corrie Ten Boom (born in Haarlem, North Holland) and Anne Frank (though German-born spent her childhood and years in hiding, in Amsterdam). The name "Holland" first appeared in sources in 866 for the region around Haarlem and by 1064 was being used as the name of the entire county. By this time the inhabitants of Holland were referring to themselves as "Hollanders." "Holland" is derived from the Middle Dutch term holtland, meaning "wooded land." This spelling variation remained in use until around the fourteenth century, at which time the name stabilized as "Holland" (alternative spellings at the time: "Hollant" or "Hollandt"). Popular, but incorrect, etymology holds that "Holland" is derived from hol land ("hollow land") and was inspired by the low-lying geography of Holland. The proper name of the area in both Dutch and English is "Holland." Holland is a region within the country of the Netherlands. The name Holland is informally and quite incorrectly used in English and other languages, including sometimes the Dutch language itself, to mean the whole of the modern country of the Netherlands. The people of Holland are referred to as "Hollanders" in both Dutch and English. Today this refers specifically to people from the current provinces of North Holland and South Holland. Strictly speaking, the term "Hollanders" does not refer to people from the other provinces in the Netherlands, but colloquially "Hollanders" is sometimes mistakenly used in this wider sense. When referring to the Netherlands as a whole, the adjective is "Dutch." "Dutch" is not used as an adjective for "Holland" in a modern context because "Dutch" refers to all of the Netherlands, not just Holland. However, there is a good deal of confusion about this. In actual practice, the adjective "Dutch" is often, but somewhat inaccurately, used in the specific context of Holland. Holland is 7,494 square kilometers (land and water included), making it roughly 13 percent of the area of the Netherlands. Looking at land alone, it is 5,488 square kilometers in size. The population was 6.1 million in 2008. The main cities in Holland are Amsterdam, Rotterdam and The Hague. Amsterdam is formally the capital of the Netherlands and its most important city. The Port of Rotterdam is Europe's largest and most important harbor and port. The Hague is the seat of government of the Netherlands. These cities, combined with Utrecht and other smaller municipalities, effectively form a single city—a conurbation called Randstad. Each of the provinces in the Netherlands has a history that deserves full attention on its own. However, to a certain extent at least, the history of Holland is the history of the Netherlands, and vice versa. The article here focuses on those points that are specific to Holland itself or that highlight the nature of the role played by Holland in the Netherlands as a whole. The land that is now Holland had never been stable. Historical maps of Holland bear little resemblance to the maps of today. Over the millennia the geography of the region had been dynamic. The western coastline shifted up to thirty kilometers to the east and storm surges regularly wreaked havoc with the coastline. The coastline was constantly changing. The Frisian Isles, originally joined to the mainland, became detached islands in the north. At some point the sea broke a natural barrier and rushed in to fill in the area that was once called the Zuiderzee (now the IJsselmeer). The main rivers, the Rhine and the Meuse (Maas), flooded regularly and changed course repeatedly and dramatically. The people of Holland found themselves living in an unstable, watery environment. Behind the row of coastal dunes a peat plateau had grown. Much of the area was marsh and bog. The inhabitants set about cultivating this land by draining it. By the tenth century this area was brought under cultivation. The drainage however resulted in extreme soil shrinkage, lowering the surface of the land by up to fifteen meters. This combination of factors threatened the inhabitants. There were catastrophic floods that literally washed away entire regions and killed thousands. The early inhabitants understood that human intervention was necessary to save the land. The counts and large monasteries took the lead in these efforts, building the first heavy emergency dikes to bolster critical points. Later special administrative bodies were formed, the waterschappen ("water control boards"), which had the power to enforce their decisions on water management. As the centuries went by, they eventually constructed an extensive dike system that covered the coastline and the polders, thus protecting the land from further incursions by the sea. However, the Hollanders did not stop there. Starting around the sixteenth century, they took the offensive and began land reclamation projects, converting lakes and marshy areas into polders. This continued into the twenteth century. This ongoing struggle to master the water played an important role in the development of Holland as a maritime and economic power and in the development of the character of the people. Until the ninth century, the inhabitants of the area that became Holland were Frisians. The area was part of Frisia. At the end of the ninth century, Holland became a separate county of the Holy Roman Empire. The first count of Holland known about with certainty was Dirk I, who ruled (also as count of Frisia) from 896 to 931. He was succeeded by a long line of counts in the House of Holland. 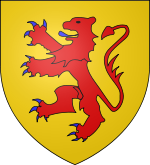 When John I, count of Holland, died childless in 1299, the county was inherited by John II of Avesnes, count of Hainaut. By the time of Willian V (House of Wittelsbach; 1354-1388) the count of Holland was also the count of Hainaut, Flanders and Zealand. During this time a part of Frisia, West Friesland, was conquered. (As a result, most provincial institutions, including the States of Holland and West Frisia, would for centuries refer to "Holland and West Frisia" as a unit.) The Hook and Cod wars began around this time and ended when the countess of Holland, Jacoba or Jacqueline was forced to give up Holland to the Burgundian Philip I in 1432. In 1432 Holland became part of the Burgundian Netherlands and since 1477 of the Habsburg Seventeen Provinces. In the 16th century the region became more densely urbanized, with the majority of the population living in cities. Within the Burgundian Netherlands, Holland was the dominant province in the north; the political influence of Holland largely determined the extent of Burgundian dominion in that area. In the Dutch Rebellion against the Habsburgs during the Eighty Years' War, the naval forces of the rebels, the Watergeuzen, established their first permanent base in 1572 in the town of Brill. In this way, Holland, now a sovereign state in a larger Dutch confederation, became the center of the rebellion. It became the cultural, political and economic center of the United Provinces in the seventeenth century Dutch Golden Age, the wealthiest nation in the world. After the the King of Spain was deposed as the count of Holland, the executive and legislative power rested with the States of Holland, which was led by a political figure who held the office of Grand Pensionary. The largest cities in the Dutch Republic were in the province of Holland such as Amsterdam, Rotterdam, Leiden, Alkmaar, The Hague, Delft and Haarlem. From the great ports of Holland, Hollandic merchants sailed to and from destinations all over Europe, and merchants from all over Europe gathered to trade in the warehouses of Amsterdam and other trading cities of Holland. Many Europeans thought of the United Provinces first as "Holland" rather than as the "Republic of the Seven United Provinces of the Netherlands." A strong impression of "Holland" was planted in the minds of other Europeans, which then was projected back onto the Republic as a whole. Within the provinces themselves, a gradual slow process of cultural expansion took place, leading to a "Hollandification" of the other provinces and a more uniform culture for the whole of the Republic. The dialect of urban Holland became the standard language. The formation of the Batavian Republic, inspired by the French revolution, led to a more centralized government. Holland became a province of a unitary state. Its independence was further reduced by an administrative reform in 1798, in which its territory was divided into several departments called Amstel, Delf, Texel, and part of Schelde en Maas. From 1806 to 1810 Napoleon styled his vassal state, governed by his brother Louis Napoleon and shortly by the son of Louis, Napoleon Louis Bonaparte, as the "Kingdom of Holland." This kingdom encompassed much of what would become the modern Netherlands. The name reflects how natural at the time it had become to equate Holland with the Netherlands as a whole. 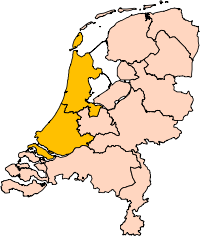 Holland was divided into the present provinces, North Holland and South Holland, in 1840, following the Belgian Revolution of 1830. This reflected an historical division of Holland along the IJ into a Southern Quarter (Zuiderkwartier) and a Northern Quarter (Noorderkwartier). From 1850 a strong process of nation formation took place, the Netherlands being culturally unified and economically integrated by a modernization process, with the cities of Holland at its center. "Holland" is not in itself a province of the Netherlands. It is divided into two provinces of the Netherlands—North Holland (Noord-Holland) and South Holland (Zuid-Holland). These provinces were created in 1840 largely because it was unacceptable for Holland to remain such an overwhelmingly large and powerful province in comparison to the other provinces. A few regions that were historically part of Holland have been ceded to other provinces. Some cessions occurred as a result of reforms during the French occupation (1795-1813). In 1818 Willemstad and surroundings, the Biesbosch and the Land van Altena became part of the province of North Brabant. In 1942, after the Battle of the Netherlands, the Germans transferred the islands of Vlieland and Terschelling to the province of Friesland. This was not changed back after World War II. In 1950, the island of Urk went to the province of Overijssel and then in 1986 to the province of Flevoland. In 1970 Oudewater was transferred from South Holland to the province of Utrecht. In 1989 Woerden was transferred from South Holland to the province of Utrecht. In 2000 Graveland and Kortenhoef, both in the province of North-Holland, were merged with Loosdrecht in the Province of Utrecht. In 2002 Vianen was transferred from South Holland to the province of Utrecht. The municipality of Eemnes has a co-operation with Laren and Blaricum. They are collectively referred to as the "BEL region." Holland is comprised of various regions that, for historical or other reasons, have their own identities. Some of these regions are unofficial, ill-defined and sometimes overlapping. Others are official and are part of regional groupings artificially created for various administrative purposes. These regions are not the same as the municipalities. For example, the South Holland village of Warmond is officially part of the municipality of Teylingen, but it is also located in the "Dune and Bulb Region" (called "Duin- en Bollenstreek" or usually just "Bollenstreek"). This is significant because the identity of Warmond is closely tied to the Bollenstreek. The language primarily spoken in Holland is Dutch. Hollanders often refer to the Dutch language as "Hollands." Despite the correspondence between standard Dutch and the Dutch spoken in Holland, there are local variations within Holland itself that differ from standard Dutch. The main cities each have their own traditional dialect. A small number of people, especially in the area north of Amsterdam, still speak what is considered to be an original, older dialect, known as "Hollandic." The areas where people still speak with the Hollandic dialect are Volendam and Marken and the area around there, West Friesland and the Zaanstreek. Hollanders themselves, however, take Holland's cultural dominance for granted. To them, the concepts of "Holland" and the "Netherlands" coincide. Consequently they see themselves not primarily as "Hollanders," but simply as "Dutch" (Nederlanders). The stereotypical image of Holland is an artificial amalgam of tulips, windmills, clogs, cheese and traditional dress (klederdracht). Like all stereotypes, this is far from the truth and reality of life in Holland. This can at least in part be explained by the active exploitation of these stereotypes in promotions of Holland and the Netherlands. In fact only in a few of the more traditional villages, such as Volendam and locations in the Zaan area, are the different costumes and wooden shoes still worn by some inhabitants. ↑ Antheun Janse, "Een zichzelf verdeeld rijk" in Thimo de Nijs and Eelco Beukers (eds. ), 2003, Geschiedenis van Holland, Volume 1, p. 73. ↑ Willem Frijhoff, "Hollands hegemonie" in Thimo de Nijs and Eelco Beukers (eds. ), 2002, Geschiedenis van Holland, Volume 2, p. 468. ↑ Hans Knippenberg and Ben de Pater, "Brandpunt van macht en modernizing" in Thimo de Nijs and Eelco Beukers (eds. ), 2003, Geschiedenis van Holland, Volume 3, p. 548. ↑ Rob van Ginkel, "Hollandse Tonelen" in Thimo de Nijs and Eelco Beukers (eds. ), Geschiedenis van Holland, Volume 3, p. 688. ↑ Hans Knippenberg and Ben de Pater, "Brandpunt van macht en modernizing" in Thimo de Nijs and Eelco Beukers (eds. ), 2003, Geschiedenis van Holland, Volume 3, p. 556. ↑ Thimo de Nijs, "Hollandse identiteit in perspectief" in Thimo de Nijs and Eelco Beukers (eds. ), 2003, Geschiedenis van Holland, Volume 3, p. 700. Tawney, R. H. 1926. Religion and the rise of capitalism; a historical study. New York: Harcourt, Brace and Co. This page was last modified on 12 January 2018, at 15:35.